The legendary Bay Area rock superstars Grateful Dead scored with a plethora of wonderful recordings throughout their incredible career that encompassed four decades. Their concerts were of legendary proportions, and during their mammoth breakthrough years of the late sixties, a whole new audience was discovering their magic thanks to their inspiring concerts and musical acumen. As a new touring season began, the Dead celebrated with a very appreciative New York City audience at the Fillmore East. This masterful performance went on to become one of the most revered ever in their long concert history. Always known for being on top of the audiophile medium, the Dead would record a lot of their shows over the years with state of the art equipment. 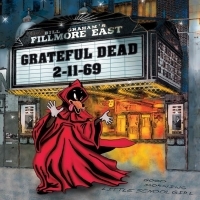 This particular show was of no exception as long time Dead member/producer Phil Lesh and producer John Cutler teamed up with the definitive Dead archivist David Lemeiux and compiled the much celebrated Fillmore East 2-11-69. Friday Music is very pleased to announce the exclusive first time 180 Gram Audiophile 3 LP Deluxe Set of the Grateful Dead’s Fillmore East 2-11-69. This amazing limited edition treasure trove features tunes from these historic concerts, both early and late shows. Filled with 17 stellar first time audiophile vinyl performances, The Grateful Dead’s Jerry Garcia, Bob Weir, Phil Lesh, Mickey Hart, Bill Kruetzmann, Ron McKernana and Tom Constanten truly radiate with some of their finest playing and singing ever, making this a wonderful listen and highly collectible album for years to come. Many favorite Grateful Dead classics and superior rarities abound in this lengthy limited edition audiophile dream set including the long-awaited audiophile vinyl releases of St. Stephen, Dupree’s Diamond Blues and the superior jam of the Bobby Blue Bland classic Turn On Your Lovelight. Known for their lengthy jams, solid live masterpieces get their due on this amazing set like brilliant versions of Dark Star, The Other One, and The Eleven. As an added super rare treat, a tip of the hat to The Beatles is preserved in the audiophile domain with their fine interpretation of Hey Jude as well as a pair of masterful blues classics with King Bee and Good Morning Little School Girl. Now for the first time ever as an exclusive 180 Gram Audiophile Vinyl 3LP Set, Friday Music is very honored to announce the limited edition Grateful Dead authorized release of Fillmore East 2-11-69. Mastered for vinyl by Joe Reagoso (Grateful Dead / Deep Purple / Yes) at Friday Music Studios and at Capitol Records, Hollywood, CA, featuring 2015 restored vault tapes by David Glasser, this wonderful album is sure to become a welcomed addition to your Dead collection. The Grateful Dead’s Fillmore 2-11-69 album is packaged in a stunning tri-fold cover with artwork detailed beautifully, Gary Lambert’s original liner notes, and with a poly lined LP sleeve to preserve the rich details of each of the three 180 Gram vinyl albums. Wonderful retro LP label artwork is also provided for each vinyl album.